FALKE produces a range of ski and snowboard socks for both recreational skiers and snowboarders, as well as performance socks including a compression range, and socks for ski racing and ski touring — for men, women and children. FALKE socks are available in a range of thickness, with all models featuring extra-volume cushioning to protect against pressure points, with toe boxes and right and left cushioning. Depending on which model — constructed with a mix of silk and merino wool, with the compression “Energising” model made with a pix of polyamide, wool, polypropylene and elastane to improve circulation and speed up recovery. 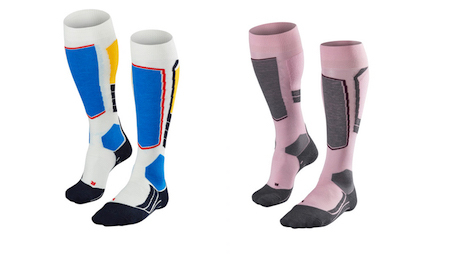 FALKE socks cost from £26 a pair. To get the best out of your skiing week — and your socks — FALKE recommends taking three pairs away on your holiday, hence are offering one lucky Where to Ski & Snowboard reader a three-pack of its SK2 socks, which retail at £28 a pair. To enter click here and answer one easy question. Competition closes at noon on Friday, 15 March. The winner will be drawn at random shortly after that date, and notified by email. No cash alternative is available. So, why are we specifically giving away a pack of three socks? Because that’s the minimum number you should take on a week’s holidays, says FALKE. FALKE also makes a fantastic range of ski-specific baselayers and underwear with its trademark moisture-wicking and thermal-management capabilities, along with supreme comfort.